From Spitfire: “Re: being anonymous. Why would you want to be anonymous and miss the exposure and benefits?” Being anonymous means I can do exactly what I want. No boss, no ability to be threatened or bribed, and no having people bug me because they know who I am. I can roam the HIMSS floor just like anyone else since I always make up a non-descript employer and title. I don’t want attention and I’m more effective by far without it. More power to those folks who try to milk their tepid fame by taking speaking engagements, accepting vendor-written puff pieces for cash, or wangling invitations to parties or events, but that’s just not me. I’d rather work alone and without a master. The final HIStalkapalooza count, at least what House of Blues billed me for, was 693. That’s pretty much perfect since it was right at the minimum headcount I had to pay for without going over. I broke even financially thanks to the participation of some last-minute sponsors, so I’m happy about that since it looked like I was going to lose dozens of thousands of dollars. We invited 1,576 people and got RSVPs back from 974. 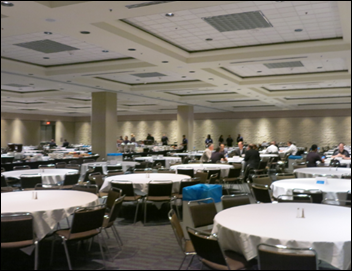 Even after letting in anyone with a HIMSS badge in later in the evening — once we realized that the usual no-shows would preclude us from hitting our HOB minimum, so we might as well at least get something for the money that was going to be spent no matter what — we only got to 693 attendees. You can see why trying to budget for an event this size is full of risk and uncertainty – the no-show rate is frustratingly massive. Everybody lusts to attend, but at least 70 percent of those we invited didn’t actually show up. Which is a good thing, because if they had, since we built in a big (but not big enough) no-show factor, I would be bankrupt right about now. Bistro HIMSS looks like this. It’s down on the 100 level on the end of the concourse. Anyone can wander in and buy a $25 lunch that includes one trip through the buffet (which includes a decent salad bar), fruit, desserts, and coffee and tea. You can buy a table for the price of 10 tickets and use it for the whole day, which is what we did for the CMIO lunch. 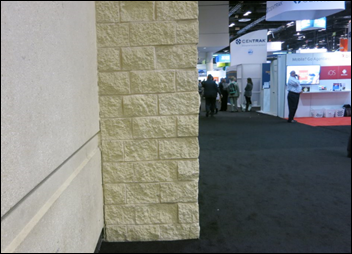 People on phones — at least those who are courteous enough to not stumble slowly through the main aisles and risk getting rear-ended while yapping publicly — love spots like this where they are shielded from passers-by. It’s like police officers trained to park their cars a couple of feet to the left of one they’ve stopped to give themselves a protected channel for walking to the driver’s-side window of the stopped car without getting mowed down by a careless driver. Something was going on here, but I’m not sure what. 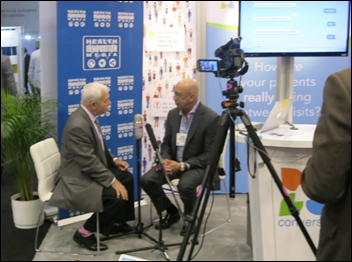 Does anyone really listen to recorded audio like HIMSS radio and podcasts? I never have. 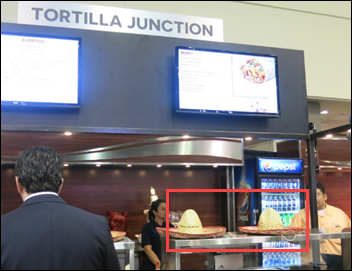 The concession stand’s Mexican food is apparently so authentic that the employees arriving for work placed their commuting sombreros right on the counter. I also saw attendees eating food from the “Asian” restaurant with chopsticks, which seems odd when the exotic cuisine of the Far East that required authentic tableware is Americanized crap that that no actual Asian would recognize, like orange chicken (Happy Meal-style fried chicken nuggets smothered in marmalade to deliver a megadose of fat, sugar, and salt). 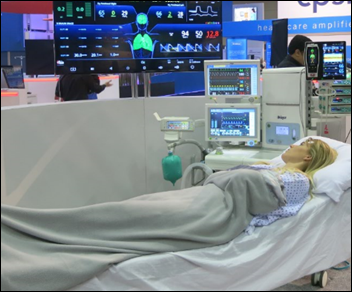 I hope this ill yet resolutely attractive woman recovers to the point that she can be transferred from the HIMSS exhibit hall to Orlando Regional Medical Center. Perhaps someone should start an IV. 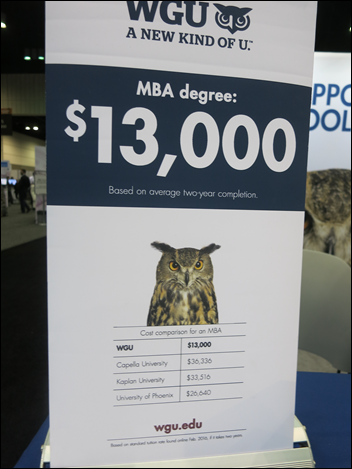 The non-profit WGU (Western Governors University) was boldly touting its low-priced yet accredited degrees vs. those of for-profit competitors like Capella, Kaplan, and University of Phoenix. They offer degrees like an RN-to-BSN, MSN, MBA in healthcare management, and MSN in nursing informatics. I continue to seek examples where the word “currently” adds value. Someone had an operation game going. Maybe these white-coated folks are actual surgeons to compete against. This is one of the more elegant spreads offered. 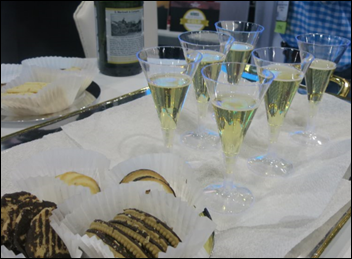 I’m not sure if the sparkling drink was real or fake champagne. I think the vendor was Mozaic Medical. The magnificent magician / psychic / comedian Bob Garner made someone cry at every one of the several performances I watched at the NTT Data booth today. For example, he asked an attendee to write down the name of a deceased loved one, and with nothing more than that to go on than that, described her father in precise detail right down to his description, name, military service, cause of death, and the exact layout of the military group photo of him that she keeps. I can’t do it justice with any description that I can conjure, but it’s the most amazing thing I’ve ever seen no matter how skeptical I might be of the whole concept. He sought Lorre and me out as the show closed to say hello and to describe his message and purpose as one of hope. I’m jaded, cynical, and a scientifically driven debunker and yet I found myself feeling like I was watching something unknown and yet comforting. 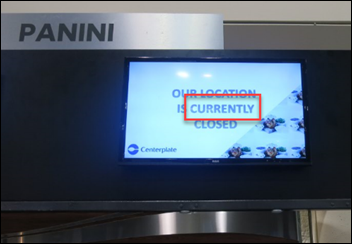 Bob has retired, but NTT Data convinced him to return to HIMSS17 and he seemed begrudgingly willing to consider returning to HIMSS18. He’s a nice guy besides. 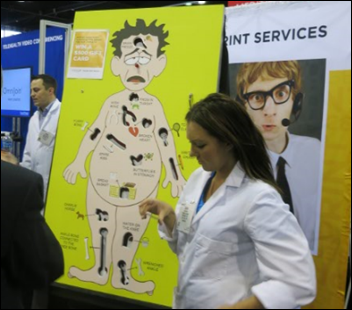 First Databank offered a five-question patient safety quiz kiosk and donated $10 for each correct answer to the National Patient Safety Foundation. I said hello to Teresa from Eclipse because she was fully alert and engaging passers-by from the company’s tiny and bare booth. They offer project management tools, and to me at least, a free tee shirt. The trend I saw this year was tilted, large touch-screen monitors for doing demos without a mouse or keyboard, also playing video as needed. They are effective. I remarked to one vendor that it seemed like there were fewer multi-level booths this year. He said HIMSS started charging by volume rather than just area, so taller booths now require paying more. I proposed to one vendor that HIMSS fund a free B2B mixer Wednesday as the show closes to allow exhibitors to strike up conversations that could lead to partnerships or even acquisitions, but then when I saw the huge, snaking line of sales reps towing wheeled bags to the free HIMSS airport shuttle bus within minutes of the exhibit hall’s 4:00 closing, rethought whether anyone would bother sticking around. Predictive analytics vendor Inovalon reports Q4 results: revenue down 20 percent, adjusted EPS $0.05 vs. $0.13, beating expectations for both. EMDs hires Eric Weidmann, MD (South Austin Medical Clinic) as chief medical officer. Arnot Health (NY) selects Harris Healthcare’s ED PulseCheck ED information system. That’s all for me from HIMSS17. I’m spending a few more days in Florida, but will keep working from the beach. Thanks Mr. H! I appreciate the HIMSS coverage from you and the Team. By the way, WGU is an excellent program. The MBA is state of the art with a rigorous curriculum, strong mentors and extraordinary use of simulations to get students working together, even if virtually. It was originally developed through the sponsorship of the governors of 10 western states (hence the name!). No, I didn’t attend and don’t teach there, but know students who have. Once again well done on covering the event! We read with interest your “just arrived at HIMSS17” comments about staying at a condo “with lakeview” instead of hotel. We’d done the same thing and were looking forward to enjoying our three bedrooms, kitchen and porch overlooking the pond / lake. Our experience was a little different than yours, unfortunately. We arrived late Sunday evening, used our keyless entry code, and walked into a condo full of other people’s stuff. Lucky for us the people weren’t there at that particular moment. The hand written sign on the door saying “don’t clean this room” was an indicator something was amiss. It took us 10 minutes to figure out what number actually worked at 10pm at night. We finally got to a human who told us to leave immediately. Note that if we hadn’t entered, we’d never have been able to find the after hours numbers that was on a sign in the kitchen but not in our confirmation email. An hour later we had a “good news / bad news” situation. We had a new condo to stay in for the night. But we’d have to move EVERY DAY. Thus our “touring the Vista Cay Condos while at HIMSS17” adventure began. Bad news is we had to pack up every morning. Good news is they moved our bags for us while we were at the conference. I can say the three condo units we experienced were all quite nice, although one had issues like bathroom plugs not working and TV’s with no audio. Next year we’ll rethink the “middle man” we used for the reservation. But we are definitely sold on the condo scenario over a hotel. It was definitely more cost effective, especially after the nice discount I’m getting ready to negotiate with the original booking agents! Currently is a crutch word, to me, unless used to discuss matters of chronological or historical significance. I might argue its needed to report on the status of something over time, such as a patient’s symptoms. Literally no value otherwise. I didn’t attend HIMSS this year, but will note that I too was struck by something I saw about SalesForce in the run-up. It was quiet, without the usual marketing bluster, but the substance of it made me think that some powerful logistic moves were in play. Last week was the kids’ school break, but I had on my tickler sitting down to look at their online demos and such when I got back, and ask my HIMSS-attending friends if they took note of SalesForce. Your note redoubles my intent. There has always been this sense that the “real” players in IT writ large haven’t yet come to healthcare. Messy legacy systems, essential to 24-7-365 clinical care and to low-margin/ high through-put revenue cycles, and painful enterprise sales cycles may have kept them out. 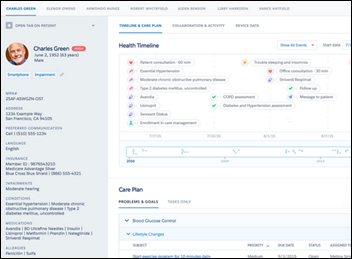 SalesForce may be exactly the kind of adaptable middleware that can ride out the technical turbulence and time frames required to bring better user experience of HIT in the delivery of care.